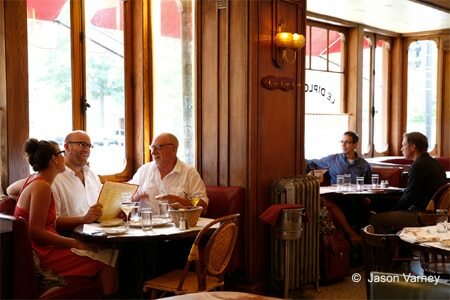 : Bustling Le Diplomate features a Parisian bistro atmosphere with its smoky mirrored walls and dark wood interiors. Patrons line up (literally) to get a table to enjoy the French cuisine (best bet: make reservations well in advance). Start with the escargots drenched in a parsley-garlic butter and topped with puff pastry; add to that pâté de campagne, a textured wedge of country pâté packed with flavor and accompanied by pickled vegetables, mustard, and toasted country rye. Other treats include tuna carpaccio and a foie gras parfait. Lighten the meal with the green salad tossed in a mild vinaigrette and garnished with thin slices of vegetables and Parma ham. Except for the burger, entrées are classics from the bistro repertoire: beef bourguignon and fork-tender braised lamb seasoned with harissa and accompanied by Moroccan couscous and yogurt. Check out the daily specials, too, and if you dine on Tuesday you can try the tempting lobster with a creamy risotto. For dessert, you'll find a chocolate caramel tart with hazelnut ice cream and streusel. Do not skip past the special cocktail selections; check out the extensive wine list as well. At brunch, the menu launches into a medley of breakfast and luncheon dishes: oysters and half lobsters beckon, but no one should overlook the plate of pastries with a rich onion soup or ricotta ravioli as appetizers. Continue with fluffy pancakes, french toast with Champagne-infused strawberries or the steak and eggs. The smoked salmon tartine and the lamb sandwich also merit an order. Iced beverages, morning tipples and steaming coffee add their own punch.